058 "A Thousand Cranes for Peace"
This painting is made up of three canvases. The top canvas is a 16" x 20" oval. The middle canvas is a 16" x 50" rectangle. The bottom canvas is a 30" x 8" rectangle. The bottom canvas has a black background, which represents the core of the Infinite Potential from which all things manifest. There is a yin-yang symbol, which symbolizes the ever changing churning of the universe. The paper cranes arise out of this void (God, Infinite Potential). The middle canvas has grey bars in the background, which are the ashes of war. The straight lines symbolize the buildings of human society, which are in contrast to the curving lines of nature. The structures of man are destroyed in war. From the ashes arise the one thousand cranes (or one thousand phoenixes). 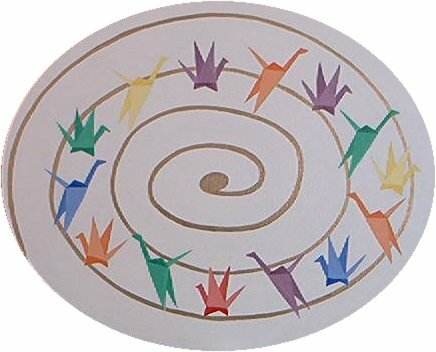 The top canvas has a white background with paper cranes forming an eternal circle. This represents the aspirations of human society to attain WorldPeace. There is a golden spiral, which is a sacred symbol for the ever expanding and contracting underlying nature of this reality. When Hiroshima was bombed on August 6th, 1945, the Sasaki family was spared. Or so it seemed. 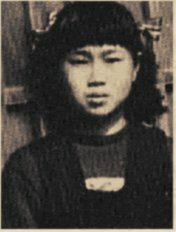 Sadako Sasaki was only two at the time. Until the age of twelve, she grew strong and healthy and was the fastest runner on her school’s relay team. One day at school Sadako felt strange and dizzy, a feeling that she kept hidden. A few weeks later, while running, everything seemed to whirl about her and she sank to the ground. Sadako had leukemia, "the atom bomb disease". While she was in the hospital, her closest friend reminded her of an old Japanese legend. If she folded a thousand paper cranes, the gods might grant her wish to be well again. With courage and faith, Sadako began folding. Though she was only able to fold 644 cranes before she died, Sadako had a profound impact on her friends and classmates. They completed her thousand cranes and raised money from school children all over Japan to build a statue honoring Sadako and all the children affected by the bomb.